Heidi Barnes Heller, DVM, DACVIM, is clinical assistant professor at University of Wisconsin. Her research interests include feline seizures, novel antiseizure treatments, and canine meningoencephalitis. Clinical interests include spinal and brain surgery and seizure management. A graduate of Michigan State University, Dr. Heller completed a rotating internship at University of Illinois and residency in neurology and neurosurgery at University of Florida. 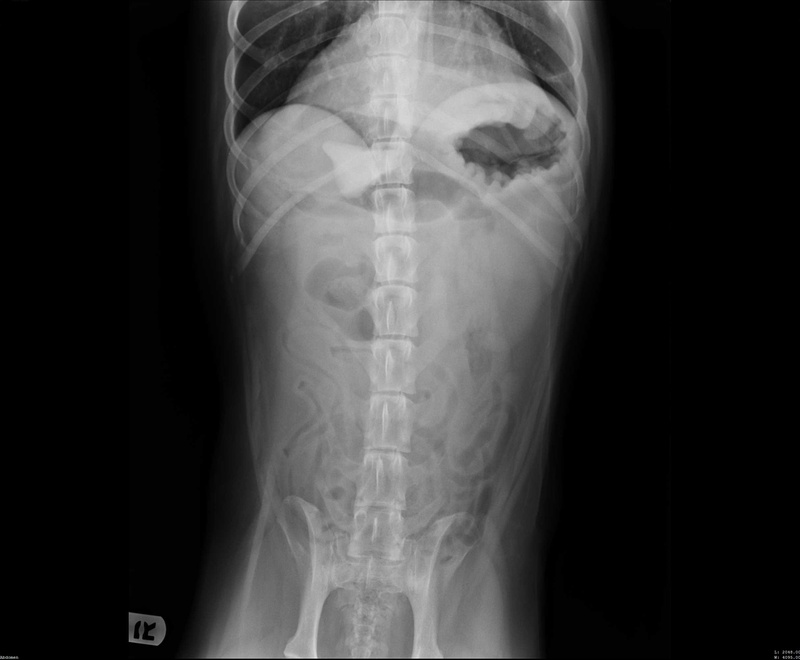 A 4-year-old spayed chocolate Labrador crossbreed was presented for vomiting and excessive drooling of 2 days’ duration. Ptyalism and apparent abdominal pain were noted on physical examination, but no foreign body or mass was palpated. History included GI surgery to remove a rock foreign body approximately 1 year prior to presentation; the surgery was uneventful, and the patient recovered completely. There was no known history of toxin exposure. 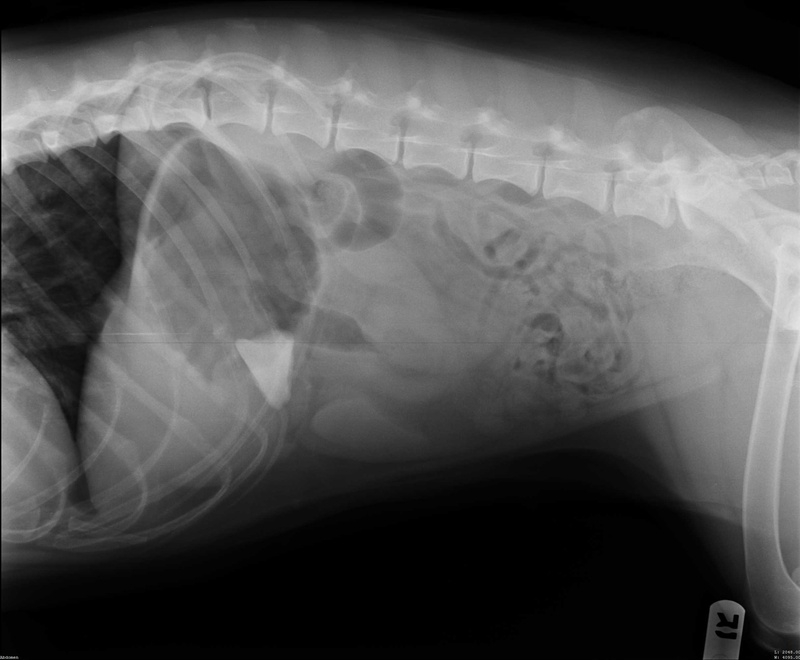 Rule-outs included gastroenteritis, pancreatitis, GI foreign body, toxin, and neoplasia. 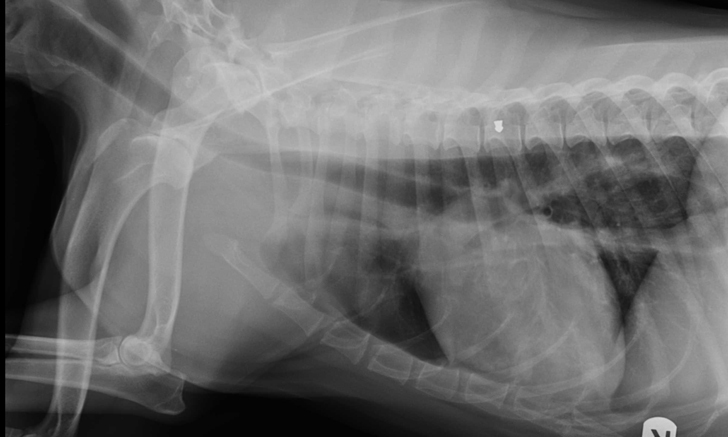 Abdominal radiographs revealed a rock in the patient’s stomach, leading to a diagnosis of a gastric foreign body with outflow obstruction and a secondary finding of megaesophagus. Gastrotomy was performed to remove the foreign body. Perioperative medications included hydromorphone, maropitant, cefazolin, propofol, and sevoflurane. The patient recovered well from surgery and was transferred to a local emergency clinic for overnight monitoring. Ataxia was observed in the patient overnight; the attending veterinarian attributed the ataxia to the pain medications. The next morning, patient was re-presented to the original veterinarian with bilateral pelvic limb weakness and ataxia. Intravenous fluids and antibiotics (cefazolin 22 mg/kg IV q8h), sucralfate, and famotidine were maintained, and hydromorphone was discontinued. Weakness, along with hypersalivation, worsened throughout the day. Addison's disease and myasthenia gravis were added to the list of differentials. While additional diagnostics were pending, the patient continued to deteriorate, was unable to walk, and developed aspiration pneumonia. She was transferred to a local referral center to be evaluated by an emergency veterinarian and a neurologist. During a Tensilon test that appeared positive, the patient was able to take several steps before becoming weak and collapsing again. Neurologic examination revealed diffuse lower motor neuron disease. Repeat blood work was unremarkable, and thoracic radiographs showed megaesophagus and aspiration pneumonia. The patient was diagnosed with acute fulminating myasthenia gravis. Neostigmine was administered to treat possible myasthenia gravis; however, treatment resulted in salivation, lacrimation, urination, and defecation (SLUD) signs so atropine was administered. The patient’s SLUD signs appeared to resolve in response to atropine, whereas myasthenia gravis appeared to respond to neostigmine, and the patient was able to walk short distances. After approximately 12 hours, the patient regurgitated a large amount and became dyspneic. The owners elected humane euthanasia. The results of the acetylcholine receptor and antibody (AChR AB) tests confirming myasthenia gravis diagnosis were not available until after the dog was euthanized. The patient’s history and presence of the rock foreign body distracted from the subtle signs of myasthenia gravis. At presentation, it was likely that the patient was regurgitating—not vomiting. However, differentiating between regurgitation and vomiting based on the owner's impressions is often difficult. Given the patient’s history, vomiting seemed likely and regurgitation was not immediately considered. Did the stress of surgery exacerbate the underlying myasthenia gravis? There are 2 forms of myasthenia gravis: congenital and acquired. The dog in this case was affected by acquired myasthenia gravis, suggested by both the dog’s age and by the positive acetylcholine receptor antibody titer. Acquired myasthenia gravis is an immune-mediated disease in which there is an antibody (IgG/IgM) attack against the acetylcholine receptor. Any medication affecting the neuromuscular junction, such as the obvious neuromuscular blocking agents (eg, pancuronium, atracurium), as well as lesser-known drugs (eg, ampicillin), may affect neuromuscular transmission. Would the outcome have been different if the veterinary team had focused on megaesophagus from the start? Giving injectable acetylcholinesterase antagonists (eg, neostigmine) for 24 hours may have stabilized the patient’s neuromuscular disease with less risk for neuromuscular collapse; however, the decision to use neostigmine must be balanced with the risk for progressive GI obstruction. Although endoscopy for rock removal could have been considered instead of gastrotomy, if endoscopy proved ineffective, gastrotomy may still have been required if clinical signs (ie, persistent abdominal pain, vomiting, biochemical evidence of gastric outflow obstruction) were more supportive of obstructive GI disease than of megaesophagus. Anesthetizing patients with megaesophagus is always associated with an increased risk for aspiration pneumonia. Management with neostigmine for 24 hours is unlikely to have resolved the megaesophagus clinically or functionally. However, after providing neostigmine, if the veterinarian were aware of the presence of neuromuscular disease or, specifically, myasthenia gravis, he or she may not have elected to pursue surgical intervention, and the patient might have received different supportive care. These cases are difficult to manage. Honest, open, and comprehensive conversations between the veterinary team and the pet owner can alleviate the stress of decision-making and ultimately lead to the right decisions for the patient. Zuccolotto EB, Nunes GC, Nogueira RS, Pagnussatt Neto E, Nociti JR. Anesthetic management of a patient with multiple sclerosis - case report. Braz J Anesthesiol. 2016;66(4):414-417.